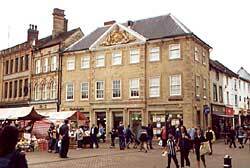 The Moot Hall in Mansfield Market Place, given in 1752 by Lady Oxford of Welbeck Abbey (A. Nicholson, 2000). CAMDEN, in his quaint sketch of the county, says: More inward, the forest of Shirewood (which some expound by these Latine names Lympida Sylva, that is a shire or deere wood; others Proeclara Sylva, in the same sence & signification) in ancient times overshadowed all the country over with greene leaved branches, & the boughs & armes of trees twisted one within another, so implicated the Woods together that a Man could scarcely goe alone in the beaten pathes; but now the trees grow not so thicke, yet hath it an infinite number of fallow Deere, yea Stagges with their stately branching heads feeding within it. Some Townes also: among which Mansfield carryeth away the name, as maintaining a great Mercat passing well served, & as well frequented. The name of which Towne, they that delineat the Pedigree of the Graves of the great family of Mansfield in Germany use as an argument to proove the same & set downe that the first Earle of Mansfield was one of King Arthurs Knights of the round table, borne & bred at this Mansfield. Indeed our Kings used in old time to retyre themselves hether for the love of hunting: & that you may reade the very words out of an ancient Inquisition, "W. Fauconberge tenebat manerium de Cukeney in hoc Comitatu in Sergientia per Servitium ferrandi Palfredum Regis quando Rex veniret ad Mansfield," that is W. Fauconberge held the Manour of Cukeney in the County in Sergiency by service to shooe the Kings palfrey when the King came to Mansfield. And the hereditary F6resters or Keepers of this Forest of Shirewood were men in their time of high estimation, viz. Sir Gerarde de Normanvile in the time of the Conquest, the Cauzes & Birkins, by whose heire it came to the Everinghams, of which Family Sir Adam Everingham was summoned to Parliaments in the Raignes of King Edward the Second & King Edward the Third. At which time they were seated at Laxton, anciently called Lexinton, where also flourished a great family so surnamed, whose heires were marryed into the Houses of Sutton of Averham & Markham' as in previous chapters has been shown. 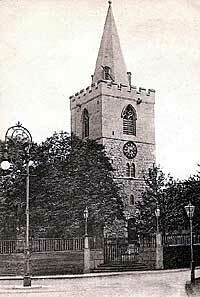 The Norman tower of St Peter's church, Mansfield (c.1905). Mansfield is said to have derived its name from the little stream called the Maun, which runs gently through it. The district around is full of interest, and the town itself (the scene of the old story of the King and the Miller of Mansfield) is worthy of notice, and possesses many interesting associations, which we hope some day to see gathered up into a comely volume. Without desiring to dive too deeply into its history, we may mention that Mansfield, with its very modern appearance, possesses claims to great antiquity. The finding of many Roman coins, including those of Vespasian, Constantine, and Marcus Aurelius, and the fact of a Roman villa having been discovered in the vicinity by the late Major Rooke, the antiquary, lead to the belief that Mansfield may have been a Roman station ; and there is no doubt that during the Saxon heptarchy the Mercian Kings frequently stayed at Mansfield, through its proximity to the forest, where sports of all kinds abounded. Edward the Confessor had a manor here, and when William the Conqueror came into possession he had here two car. or plows in demesne and five sochman, on three bovats of this land, and thirty-five villains; twenty bordars with nineteen car, and a half, one mill, one piscary; twenty-four acres of meadow, pasture wood two leu. long and two broad; and there were also in the town two churches and two priests. The manor was freely dealt with by various royal owners, gifts being made of it, or of portions of it, by William Rufus, Edward II., and Henry VI., either for church purposes, or to recompense for services rendered, or to reward favourites. In the reign of Henry VIII. it was settled by Act of Parliament on the Duke of Norfolk, for his prowess at the great Battle of Flodden Field, but subsequently exchanged by the King for some other. 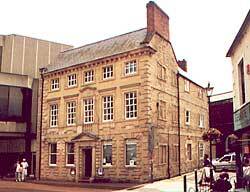 Waverley House, Mansfield, dates from 1754 (A. Nicholson, 2000). Reference is made by our county historian, Thoroton, to a fire at Mansfield Woodhouse in 1304, which partially destroyed the church. The mention of Mansfield Woodhouse brings to mind a circumstance which is worth noting, as indicative of the curious customs by which the tenure of land was held in olden days. In the reign of Henry VI., one Sir Robert Plumpton, Knight, died seized of one bovat of land in Mansfield Woodhouse, called Wolfhunt land, and one essart in the same town at Wadgate, near Woodhouse Mill, held by the service of sounding a horn, and driving or frightening the wolves in the Forest of Sherwood. We must not linger over the items which go to make up the interesting history of this thriving town, but cannot forbear mentioning that Mansfield has been the birthplace of several eminent men. Henry de Mansfield, Dean of Lincoln (A.D. 1315), was elected Bishop on the death of Bishop Dalderby, but refused to accept the dignity. Archbishop Sterne, grandfather of the famous Laurence Sterne, author of Tristram Shandy, was born at Mansfield in 1598. Sterne was a stanch Royalist, and attended Archbishop Laud on the scaffold. When the Puritans gained the mastery he wisely avoided the occasions of public strife or disputation, remaining in comparative seclusion until the Restoration, when he was rewarded with the Bishopric of Carlisle, becoming subsequently Archbishop of York. He died in 1683. Other Mansfield celebrities were: Dr. Mason, Bishop of Sodor and Man; Dr. Halifax, Bishop of Gloucester; William Martin, the naturalist; Dodsley, the energetic and estimable publisher; and Hayman Rooke, the antiquary. Lord George Bentinck, a statesman who attained great celebrity, and exercised much influence during the Corn Law agitation, and who died suddenly in Sherwood Forest while walking from Welbeck to Thoresby, in 1848, though not born at Mansfield, always took a deep interest in the town, and in memory of him an elegant Gothic monument was erected in the market-place, by subscription, in 1851. 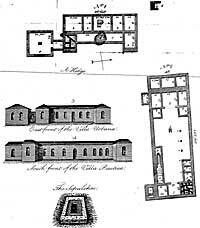 18th century plan of the Roman villa discovered by Hayman Rooke at Mansfield Woodhouse in 1789. Reference must also be made to Thompson, one of the benefactors of Mansfield, whose grave, standing on a hill which overlooks the town, and walled round with stones, is a conspicuous object from the public roadway. Thompson, who was a native of Mansfield, after a long residence in Persia as agent for the Russia Company, settled at Lisbon, where he realized a competency. In 1755, when the terrible earthquake which swallowed up Lisbon occurred, Thompson was an affrighted spectator of the scene. He had rushed at the first alarm to the nearest hills, and turning round, lie saw the huge city rocking and staggering below, while the noise of crashing buildings was mingled with the shrieks and groans of thousands of sufferers. When the earthquake was over, Thompson went back to the deserted city, where he subsequently succeeded in digging out his money; with this he returned to England, and spent the remainder of his days at Mansfield, selecting the site overlooking the town, where his grave is, as his place of sepulture, from its resemblance to the spot on which he stood when the ill-fated city of Lisbon was suddenly entombed. Mr. William Howitt, who has told the strange story of Thompsons career in his own graphic language, describes the manner of his death, which he says took place not in travel; not in sailing over the ocean, nor up the tulip-margined rivers of Persia or Arabia Felix; nor yet in an earthquake; but in the dream of one. One night he was heard crying in a voice of horror, "There! there! fly! fly! the town shakes! the house falls I Ha! the earth opens! away I, Then his voice ceased; but in the morning it was found that he had rolled out of bed between the bedstead and the wall, and there, like a sand-bag wedged in a windy crevice, he was dead. Among the interesting and thriving villages around Mansfield, mention may be made of Sutton-in-Ashfield, the nursery and home of so many county cricketers; Mansfield Woodhouse, where Mr. Rooke found the Roman villa, a full account of which may be seen in the Archaeologia; Kirkby-in-Ashfield, and other localities that are rapidly growing in population and influence with the development of the mining industry.